Gretchen cooks on our woodstove during a power outage. This is a fitting end to a challenging day. In spite of a threat of bad weather, we drove to our old neighborhood this morning to pick up some boxes we left with our good friends, Gerry and Cindy Brown. Strong winds buffeted the van all the way up and back and the big Dodge van and trailer did a lot of fish-tailing, but we made the 350 mile round trip safely. As we drove down our country lane, the lights from the neighboring houses made the neighborhood look like something out of the last century. No outside lights were showing, only muted warm glows from a few windows. We soon discovered the reason for the turn-of-the-century ambiance. The power in the neighborhood had been off for many hours. Our house was cold and dark, we were tired and hungry and the outside temperature was falling. It could have been worse, but we had planned for this contingency before we built the house. As a result, we were able to take it in stride. It turned out to be an enjoyable experience. I fired up our emergency generator so we could get things sorted out quickly and built a warm fire in our wood stove. This took less than twenty minutes. The biggest problem was keeping the excited cats out from underfoot. Any change in our daily routine get them skittering in all directions. We decided to see how well our wood stove functioned as a cook stove and it proved to be as effective as the electric range. This pan of chili was hot in minutes and Gretchen also proved to her satisfaction that she could make toast quickly by opening the front door of the stove and toasting the bread over the open fire. We had a light supper in front of a cheerful fire and went to bed early. We turned off the generator to save gasoline and left candles burning in a few places as nightlights. A few hours later the power came back on and we were awakened by the bright lights that had been left on accidently when we went around earlier flipping switches. I took the opportunity to blog this before the power fails again. Power outages are a fact of life in this part of the country. We feel we have a workable solution which can be improved with just a little more work. Our contractor has planned to set up part of our electrical system so it can be fed from either the municipal or emergency generators. When municipal power goes out, we just have to start the generator and throw a single switch to operate essential functions on emergency power. The essential functions will be key lights, the well pump, the refrigerator, some kitchen outlets, and communication systems like the phones and computers. Our 8000 watt generator will handle this load easily and will run for days if necessary. Those who are really prepared, like Doug Thompson, have a generator that switches on automatically and runs on propane. We are not ready to make that investment yet. We are making our way in our new country life one step at a time, and so far it has been going pretty much on plan, with just enough challenges to keep things interesting. Has anyone else been cooking on their wood stoves lately? This entry was posted in Country Living, Possibly Helpful Advice. Bookmark the permalink. I remember a Christmas many years ago. Amy and I had driven in from Illinois to spend the holiday with my family. A snowstorm moved in on Christmas eve and we awoke to deep snow and no power. So we fired up the wood stove in the living room and cooked both breakfast and Christmas dinner there. The power came back on right after we finished dinner. I can remember when my family moved out into the country for a year. It was mostly good except for the water tanks being below the house and we had to go away for the day if there was no power as even the toilet wouldn’t work. 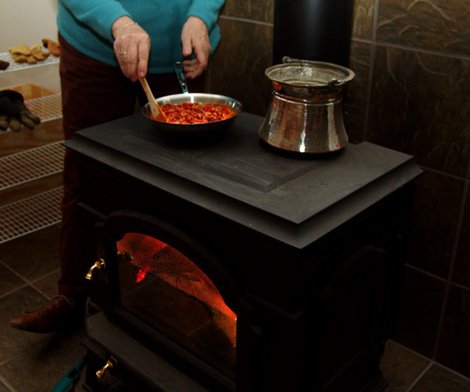 Cooking on the woodstove…a rite of passage for living in Floyd!